From The Appealing Layout To The Extraordinary Amenities, This 12th Floor Condo Is Sure To Please. Bright, Cheery, And Enhanced By City Views, This High-Rise Features A Combo Living/Dining Area With A Cute Contemporary Kitchen Boasting Granite Counters, Stainless Steel Appliances, Gas Range, Cherry Wood Cabinetry, Built-In Wine Rack, And Breakfast/Island. Nice Sized Master With A Picturesque Window, Walk-In Closet, And En Suite Offering A Large Vanity With Granite Tops, Hollywood Lighting, Travertine Tile, And Lots Of Storage Space. Secondary Bedroom/And Or Office Space Has An Extended Closet Plus It’s Own Bathroom. 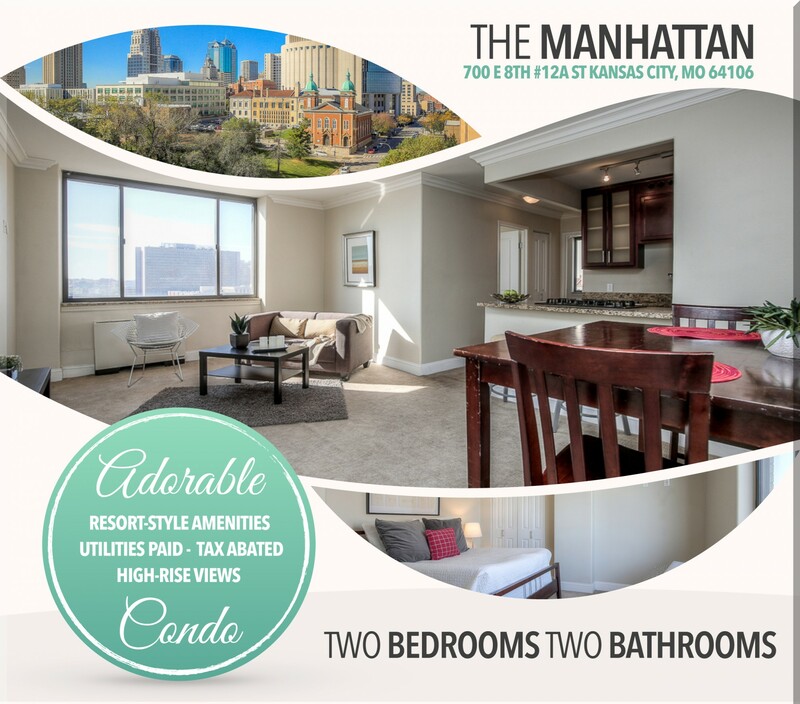 The Manhattan Offers Tons Of Resort Style Amenities Including 24-Hour Concierge, Fitness Center, Movie Theater, Club/Game Room, Tanning, Hair Salon, Penthouse Pool/Martini Bar Lounge With Deck. Arts, Entertainment, Dining, Drinking, Music, Shopping, And Live Event From The River Market To The Crossroads Are Moments From Your Door And With The KC Streetcar It Makes It Easier Than Ever To Discover All The Urban Core Has To Offer. Easy Highway Access - Within Close Proximity To UMKC School Of Medicine. Scheduled Your Private Tour Of This Gorgeous Condo Today!